Are Forests in Europe expanding or are we losing them? Sustainably managed forests in Europe are expanding. New trees are continuously being planted, so that more trees are planted than are harvested. The forest area in Europe is expanding: 512,000 hectares from 2005-2010. Forests today are over 30% larger than in the 1950s. This makes the forest a natural and renewable resource. Are tropical rainforests cut down to produce cartons? No tropical hardwood is used for cartons. The wood is not technically suitable. The real threat to rainforests comes from land hunger when forests are cleared for agriculture and fuel. In northern Europe, the main species of trees for paper and board production is spruce, pine and birch. In Spain and Portugal, eucalyptus is grown commercially. 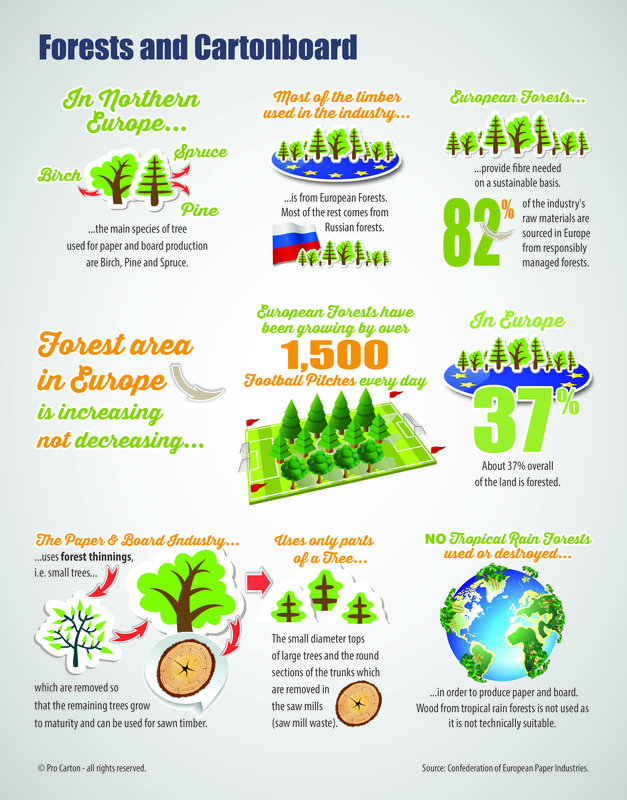 Around 80% of the wood used to make paper and board in Europe comes from European forests. Forests are in Europe is increasing and new growth exceeds the wood harvested, by an area equivalent to 1.5 million football pitches each year. How do Forests help to counter Climate Change? Trees grow by absorbing carbon dioxide and releasing oxygen. As trees grow, therefore, they remove carbon from the atmosphere and so help to reverse the “greenhouse effect”. This is known as “fixing” carbon. Trees absorb carbon dioxide by a process known as photosynthesis. In sunlight, trees, in common with all green leafed plants, convert carbon dioxide and water into simple sugars and oxygen. The sugars are polymerised naturally forming cellulose fibres. One square metre of wood captures one tonne of carbon and emits 0.7tonnes of oxygen. What is “Chain of Custody”? “Chain of custody” is the term used for tracking the origin of the raw material (primary wood fibre) at each stage of the production process of the finished goods. In order to demonstrate that wood used in the finished goods originates from a sustainably managed certified forest, manufacturers and retailers of goods produced from the forest, need a “chain of custody” certificate. Chain of custody certification is awarded by an independent body and only when the whole supply chain has been certified, can the final products be sold with a label and a corresponding claim on accompanying documentation. For forest products such as cartons, certifying the chain of custody means verifying that the wood used at each stage of the production process came from a forest certified as being sustainably managed. If is only valid if each step in the supply chain is checked. For goods manufacturers and retailers the value of this process is in being able to label the cartonboard packaging as coming from a sustainable managed forest, and benefiting from the environmental credit as consumers make their shopping choices. What is Forest Certification (PEFC and FSC)? Forest certification proves that forests are well managed. Forest owners can apply to an independent organisation to assess their forest management practices. If they meet the standards, they will get certification for their forest and the use of a logo. Whilst there is overlap in the types of forest certified by these two schemes, the FSC scheme is more generally applied to large forest areas typical of state and forest industry ownership, whilst the PEFC is generally used for the certification of smaller private and family owned forests. 99.9% of the company-owned / leased forest areas in Europe are forest management certified by independent forest certification schemes. Sustainable Forest Management is practised by European forest owners and operators who apply “sustainable development” principles when managing their forests. These cover environmental, economic and social aspects. European forests used by the paper and board industry are sustainable since every year, more trees area planted than are harvested by an area equivalent to 1.5 million football pitches. Forests provide a natural habitat to vast numbers of different species of plants and animals and preserve biodiversity.